Our selection of free healthy recipe eCookbooks is the ultimate resource for healthy eating. Each eCookbook includes a collection of healthy recipes on a theme. Whether it's healthy eating on a budget, healthy chicken recipes, vegetarian recipes or low-fat desserts, FaveHealthyRecipes.com has you covered. You can easily download and print out each eCookbook for easy reference while cooking. For help downloading our eBooks, see our help document here. 12 Simple Salad Recipes - Salads can be boring, especially if you use the same combination of ingredients time and time again. But now, you can download this free eCookbook and try a dozen different healthy salad recipes. Between the chicken salads, green salads, and deli salads, it'll be hard to decide which healthy salad recipe to try first. Learn more and download the 12 Simple Salad Recipes. The Ultimate List of Healthy Snacks: 18 Healthy Snack Recipes Free eCookbook - Everyone loves snacks, but it is often too easy to choose unhealthy snack options. But with this eCookbook, you have no excuse to be unhealthy at snack time. Learn more and download The Ultimate List of Healthy Snacks: 18 Healthy Snack Recipes Free eCookbook. 12 Healthy Baked Goods: Guilt-Free Easy Healthy Recipes - Prepare yourself because we have some exciting news; this eCookbook is filled to the brim with healthy dessert recipes. You'll escape the guilt when you make these healthy cakes, cupcakes, cookies, and dessert bars. The hardest decision is choosing which dessert recipe to make first. 17 Low-Calorie Recipes: Easy Healthy Recipes for Your Diet - This fantastic eCookbook provides you with the quick and easy recipes you'll need to help make your weight loss diet a real success story. Thanks to this collection of delicious low-calorie recipes, maintaining your diet has never been easier. 18 Healthy Breakfast Recipes: Our Go-To Easy Healthy Recipes - To stay full and focused all day long, a healthy breakfast is an absolute must. With so many easy breakfast recipes, this free eCookbook, 18 Healthy Breakfast Recipes: Our Go-To Easy Healthy Recipes, has everything you need to get going in the morning. Learn more and download the 18 Healthy Breakfast Recipes: Our Go-To Easy Healthy Recipes. 18 Easy and Healthy Casserole Recipes For You - The eCookbook contains a collection of the easiest and healthiest casserole recipes for dinner that your whole family will love. This collection includes casserole recipes for vegetarians and meat lovers. Enjoy dinner without the extra calories with this free eBook. Learn more and download the 18 Easy and Healthy Casserole Recipes for You. 11 Low-Carb Recipes: The Best Homemade Healthy Recipes - Here we have assembled some of the absolute best low-carb diet recipes around, including low-carb snacks, low-carb dinners, and low-carb desserts. This simple eCookbook has just about everything you would ever want to include on your healthy diet. 8 Healthy Cake Recipes for Any Occasion - This delicious eCookbook, 8 Healthy Cake Recipes for Any Occasion allows you to enjoy one of your favorite desserts in a guilt-free way. These recipes include many healthy ingredient swaps, which allow you to enjoy the same sweet flavor and light texture that we love about regular cake, without adding any extra inches to your waistline. Download your free copy of 8 Healthy Cake Recipes for Any Occasion today! Potluck Ideas: 8 Vegetarian Recipes - This fantastic eCookbook from FaveHealthyRecipes.com, Potluck Ideas: 8 Vegetarian Recipes, provides you with the quick and easy recipes you will need to keep your weight-loss goals a reality this year. Thanks to this definitive collection of delicious and healthy vegetarian recipes, maintaining your diet has never been easier. Download your free copy of Potluck Ideas: 8 Vegetarian Ideas today! 13 Healthy Comfort Food Recipes - In this awesome new eCookbook, 13 Healthy Comfort Food Recipes, we’ve gathered a whole bunch of amazing, lightened-up versions of your favorite fare. There are pasta recipes, burgers, and hearty soups; all the recipes have the robust flavors and are so satisfying that you aren’t going to be worried about not feeling full when you’re finished. Download your FREE copy of 13 Healthy Comfort Food Recipes today! 8 Recipes for Eating Healthy in the New Year - This is an amazing eCookbook that is free to download and contains numerous recipes to help you sustain your New Year's resolutions. 10 Healthy Slow Cooker Recipes - Even if you work long hours, you can still enjoy a home-cooked meal. Get inspired with this beautiful and comforting collection of healthy slow cooker recipes. Learn more and download the 10 Healthy Slow Cooker Recipes Free eCookbook. 14 Best Healthy Drink Recipes - Are you looking for drink recipes that are healthy and refreshing? Here are the 14 Best Healthy Drink Recipes Free eCoobook that will satisfy you and your family. These homemade drink recipes are all easy to make and have health benefits that will support any healthy diet. Learn more and download 14 Best Healthy Drink Recipes. 8 Easy Dessert Recipes For Summer - Everybody loves a good dessert no matter how old you are. Cookies and brownies always are good to eat but nothing can beat eating an easy summer dessert. When the weather gets hot the last thing anyone wants to do is bake. The only remedy for a warm day is a homemade frozen dessert. Learn more and download 8 Easy Dessert Recipes For Summer. 8 Egg Recipes for Healthy Eating - Spring is a great time of year to bring out your best egg recipes. From omelets and quiches to frittatas and salads, this free eCookbook has got you covered for a season filled with quick healthy recipes. Learn more and download 8 Egg Recipes for Healthy Eating. 11 Easy Soup & Stew Recipes - This free eCookbook is filled with belly-warming recipes that will light up even the dreariest of winter days. Get excited about dinner again! Learn more and download 11 Easy Soup & Stew Recipes. How to Have a Better Thanksgiving Dinner: 13 Healthy Thanksgiving Recipes Free eCookbook - You don't have to avoid all of those great Thanksgiving food traditions just because of your healthy eating habits thanks to this recipe collection. 8 Classic Recipes for the Best Thanksgiving Side Dishes - Let's be honest with ourselves here – we all could stand to eat better-for-you foods around the holidays. Download your free copy of the 8 Classic Recipes for the Best Thanksgiving Side Dishes free eCookbook today! 10 Quick and Easy Recipes For Thanksgiving Desserts - If you're looking to break out of the same dessert recipes that grace your Thanksgiving tables every year, this free eCookbook offers fresh, new ideas for Thanksgiving desserts that are not only easy to make, but fun to eat! Learn more and download the 10 Quick and Easy Recipes For Thanksgiving Desserts Free eCookbook. 10 Christmas Cookies to Make in 10 Minutes or Less Free eCookbook - This fantastic eCookbook from FaveHealthyRecipes.com, 10 Christmas Cookie Recipes to Make in 10 Minutes or Less, provides you with the quick and easy recipes you will need to keep your guests talking and give you more time to be with family and friends. Learn more and download the 10 Christmas Cookies to Make in 10 Minutes or Less Free eCookbook. How to Make Fun Foods for Halloween: 22 Healthy Halloween Recipes Free eCookbook - Halloween is an especially scary time of year for healthy eaters, which is why this free eCookbook is so great! The 27 Essential Heart Healthy Diet Recipes Free eCookbook - This eCookbook provides you with the heart healthy foods list that you will want to turn to again and again. With this free list of healthy eating ideas, maintaining heart healthy living has never been easier. How to Cook Quickly: The 26 Best Fast Healthy Dinner Recipes Free eCookbook - We’ve got your quick healthy cooking needs covered with this eCookbook. Cheap Recipes Made Easy: 25 Healthy Low Cost Recipes Free eCookbook - This eCookbook has the best healthy low budget recipes that bring you high quality taste. Enjoy Restaurant Food at Home: 28 No-Guilt Copycat Restaurant Recipes Free eCookbook - This eCookbook is full of the tastiest copycat recipes that bring restaurant food to your home kitchen. How to Have Healthy Eating Habits: 7 Healthy Meal Ideas Free eCookbook - These seven balanced diet recipes are just what you need to get your heart healthy meal plans back on track. 42 Easy Gluten-Free Recipes Free eCookbook - Just because you're not eating foods with gluten doesn't mean you can't enjoy tasty food. Let this eCookbook show you a complete list of gluten-free foods for you to make and enjoy. 19 Best Ever Grilled Chicken Recipes eCookbook - Grilled chicken is healthy and easy to make. Check out this awesome eCookbook for the very best grilled chicken recipes. 40 Healthy Easy Mexican Recipes Free eCookbook - Loaded with cheese, spices and tasty ingredients, Mexican recipes are always terrific. For a lighter take on your Mexican food favorites, download this free eCookbook today. Learn more and download the 40 Healthy Easy Mexican Recipes Free eCookbook. Healthy Muffins for All: 25 Healthy Muffins Recipes Free eCookbook - Muffins are the perfect treat, but more often than not are stuffed with sugar, fat and calories. Let this eCookbook show you how to make low calorie muffins that are simply irresistible. 31 Healthy Easy Recipes for a Slow Cooker Free eCookbook - With hardly any effort at all, a healthy low calorie slow cooker recipe transforms a few healthy ingredients into a low fat low calorie taste sensation. Learn more and download the 31 Healthy Easy Recipes for a Slow Cooker Free eCookbook. 22 Quick and Easy Healthy Chicken Recipes Free eCookbook - Some of the best healthy chicken recipes, including healthy chicken wings, healthy chicken breast recipes, and chicken and rice recipes. The recipes in this crowd-pleasing collection are fun and easy, and all of them are delicious. Learn more and download the FREE 22 Quick and Easy Healthy Chicken Recipes eCookbook. 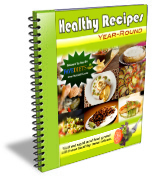 Healthy Recipes Year-Round eCookbook - Stay healthy all year with this collection of recipes that includes everything from easy recipes for a backyard barbecue to impressive appetizers for a fancy dinner party. Learn more and download the FREE Healthy Recipes Year-Round eCookbook.